...now abandoning all hope of predicting playoff contenders. They say misery loves company. 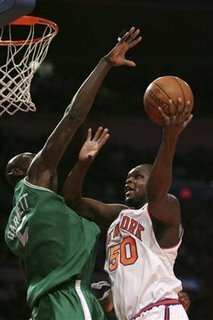 So why can't Eddy Curry and Zach Randolph co-exist on the Knicks? The Knicks actually competed against the Warriors the other night. If you know anything about standard matchups in basketball, you'd know to exploit the opponent's weakness, especially if it's supposed to be your strength. So the Knicks stayed close by using Curry and Randolph to dominate offensively inside against the lone Warriors big man, Andris Biedrins. Right? Oh, you'd be so wrong. They didn't dominate. In fact, Biedrins did. He set the NBA season-high with 25 board. Instead, the Knicks sat the big fellas and found success as reserves like Nate Robinson, Renaldo Balkman, David Lee and (gasp) Mardy Collins played solid minutes. Here's my problem with this. The Knicks need a point guard, because although Jamal Crawford has been outstanding with Marbury gone, he's better suited at the two-spot (and no one is convinced that Nate-Rob should start at the 1 anytime soon). So, with the Knicks full of immovable, overpaid players, they need to rely on getting into the lottery to select somebody like Derrick Rose of Memphis. The problem? They've been consistently competing of late, even stealing a few wins here and there. To a fan base struggling to stay interested for years now, it's almost worse that the Knicks are playing like the 7th or 8th-worst team in the NBA rather than the 3rd or 4th. It's a sad existence right now for a fan, but hey -- whatever gets them more ping-pong balls in that draft lottery. For similar thoughts and more, check out this blogger's opinion (found via ESPN.com). Welcome to All-Star Blog, the survival story of a Yankees fan living in Boston and the daily struggle to exist in Sox Nation. After writing for the Hartford Courant and several smaller publications, as well as a stint with ESPN Comm, my recent move to Beantown led me to shift my blog's focus. Please look around, and feel free to share your own stories. Because love it or hate it, the Yanks-Sox feud will never be settled. Until the Sox admit defeat.